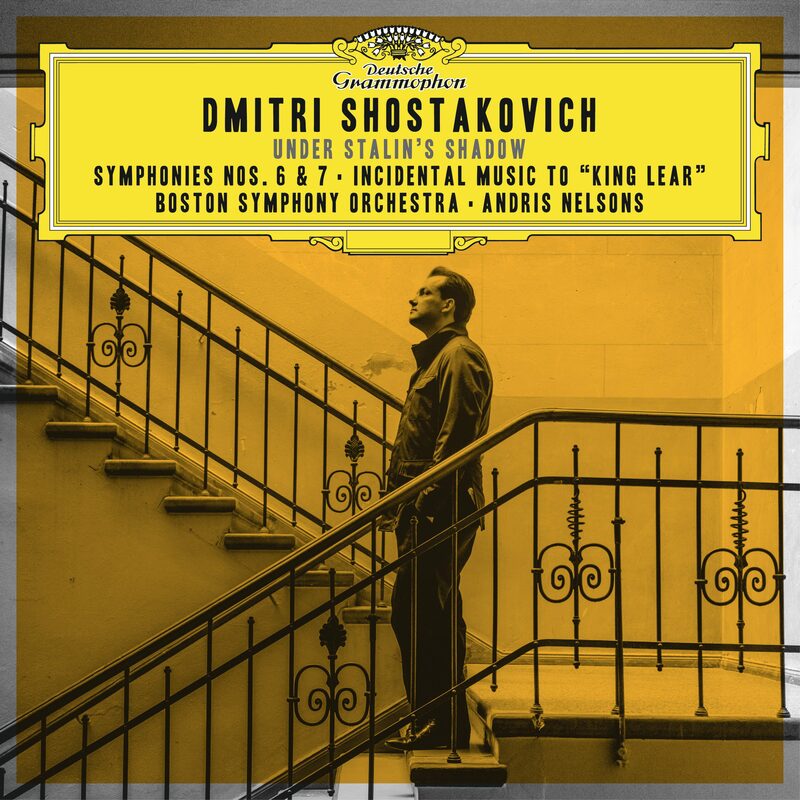 The story of Soviet music-making and the complex creative choreography it demanded from Dmitri Shostakovich is the inspiration behind Under Stalin’s Shadow, the Boston Symphony Orchestra’s revelatory series of albums for Deutsche Grammophon conducted by its Music Director Andris Nelsons. Their latest recording, set for release on 22 February 2019, presents Shostakovich’s Sixth and Seventh Symphonies together with the composer’s Suite from the Incidental Music to King Lear and the Festive Overture. Its predecessor, a compelling pairing of the Fourth and Eleventh Symphonies, has been nominated in the Best Orchestral Performance and Best Engineered Album, Classical categories for the 2019 Grammy Awards. 11 January 2019 (Toronto, ON) – Andris Nelsons and the Boston Symphony Orchestra are no strangers to success at the Grammys. They won the 2016 Best Orchestral Performance Award with the first release in Under Stalin’s Shadow, featuring performances of Shostakovich’s Tenth Symphony and music from his opera Lady Macbeth of Mtsensk, and repeated the achievement the following year with their album of the Fifth, Eighth and Ninth Symphonies, and the Suite from Hamlet. Both symphonies on their latest release date from a time of war, as does the incidental music from King Lear also included here. Nelsons sets the tone for his new album, whose contents were recorded live in concerts at Boston’s Symphony Hall in February, April and May 2017, with a deeply unsettling account of the Sixth Symphony’s opening movement. He and his Boston musicians cultivate a sense of danger from the music’s darkness, which only magnifies the subsequent irony of the second movement’s triple-time dance and the edginess of the finale. Their interpretation of the Seventh Symphony mixes dignity and menace, nostalgia for a lost world of peace and rage at the mechanised slaughter of civilians. The Sixth Symphony was completed in September 1939, the month in which Stalin, then allied to Nazi Germany, sent his Red Army to invade eastern Poland. Shostakovich’s music for King Lear, first heard in Leningrad in March 1941 as part of Grigori Kozintsev’s visionary staging of Shakespeare’s play, evokes imminent catastrophe. Three months after its premiere, Hitler’s forces stormed Russia’s western borders, cutting deep into Soviet territory. Shostakovich remained in Leningrad during the early months of the Nazi siege, volunteering to serve with the auxiliary fire brigade. In July 1941 he began work on his Seventh Symphony, directing his first-hand experience of the city’s suffering into its music. He completed the score’s defiant finale following his evacuation in October and dedicated the score to “The City of Leningrad”. Although the composer created his Festive Overture in 1954 to commemorate the 37th anniversary of the October Revolution, it’s therefore tempting to imagine its jubilant brass fanfares and galloping string themes as a celebration of Stalin’s death the previous year. On the latest release from Nelsons and the BSO, it provides a striking contrast with the darker tones of the other three works recorded. Andris Nelsons was born in November 1978 in Riga, capital of what was then the Soviet Socialist Republic of Latvia. Lenin and the dogma of dialectical materialism still governed the school curriculum and society was still haunted by a sense of fear, even if times had changed considerably since the period of Stalinism experienced by Shostakovich, whose music he grew up listening to on records in the family home and began playing at the age of five or six.